If chances on both sides had been taken and had both goalkeepers not been in top form, this cup tie would have produced the proverbial barrel full of goals. Both sides were missing players from the league match at Harlaw Park the previous Saturday which saw the visitors come away 4-2 victors. Ryan Broadhurst and Colin Charlesworth dropped out for the Railwaymen whilst for the visitors Stuart Anderson and Garry Wood were missing. 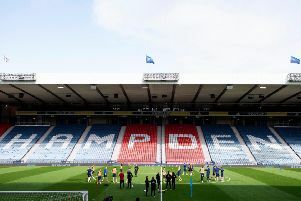 United were on the front foot from the kick-off and Ryan Stott kept home keeper Andy Reid on his toes with a 22-yard grounder inside the first minute. 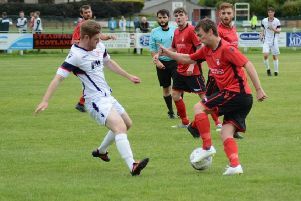 Inverurie responded with three corner kicks in quick succession but some resolute defending kept them at bay. Locos should have opened the scoring in the 20th minute. Neil Gauld squared the ball from the byeline to the right of goal with the Formartine defence posted missing but Chris Angus took his eye completely off the ball and scuffed his shot wide with the net beckoning. It was the home side again seven minutes later as Daniel Crisp sent Gauld clear down the middle with a ball played forward from the right side on the halfway line but the striker appeared to stumble in the act of controlling the ball and the half-chance was gone. Another three minutes later, this time on the left, another probing cross, from Angus, skipped across the six-yard box but Gauld slid in a fraction too late and failed to make contact. Three minutes before the break United had a chance, Stott chasing what looked like a lost cause but managing to get a foot to the ball as Reid ran from his goal but defender Connor Rennie cleared the bouncing ball off the goal line. United started the second half as they did the first and Archie Macphee thundered a free kick goalwards from an angle 25 yards out but Reid was quick off the mark and produced a fine save diving to his left to push the ball clear by the post. Connor Gethins stung the hands of Reid with a perfectly struck 25-yard volley as the crowd waited expectantly for the opening goal then just short of the hour a glorious Gethins free kick from the same distance clattered off the right-hand post, with the rebound catching Graeme Rodger full in the face six yards out, with the ball trundling past the post and Reid rooted to the spot. Moments later though the deadlock was broken and inevitably it was by United. An Andrew Greig shot was superbly saved by Reid but the ball broke to Gethins, who made it third time lucky from six yards. Locos rallied and attacked at every opportunity but a lack of depth on the bench limited their options to turn things around. In the dying seconds Rodger hit the post for Formartine then at the other end a Jordan Leyden free kick took a massive deflection and keeper Ewen Macdonald recovered to change direction and pull off a magnificent save. This stopped the match going to penalties and ensured it was the men from Pitmedden who progressed to the second round.